Unlike his destined buddy Buzz, Woody knew from the beginning he was really a toy. Nonetheless, he does as much as any full-fledged sheriff to ensure justice is served. First he turns the tables on Andy's evil neighbor Sid Phillips and goes the extra mile to reunite Buzz with all the other toys. Then he helps free Jessie from the cargo hold of a plane bound for Japan. 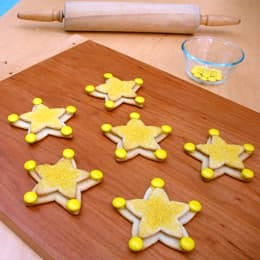 These sheriff badge cookies make a sweet tribute to the virtuous cowboy who strives to keep law and order in Andy's room. *Note: The cookie cutters used for the cookies shown here measure 3 1/4 inches and 2 1/2 inches across. Cover the tray with waxed paper and set it aside. Roll out the sugar cookie dough between sheets of flour-dusted waxed paper to a 1/4-inch thickness. Cut out an equal number of the two different sizes of stars. Use the spatula to transfer them to the tray. Then place the tray in the refrigerator to chill the cookies while you heat the oven to the proper temperature. When the oven is heated, transfer the larger stars to a baking sheet and return the tray (with the smaller stars still on it) to the refrigerator. Bake the larger stars according to the recipe directions or until they just begin to brown around the edges. Allow them to cool on the baking sheet for about 1 minute and then transfer them to the wire cooling racks. Remove the smaller stars from the refrigerator and have your child sprinkle yellow colored sugar on them. Then transfer them to a baking sheet. Bake and cool them as you did the first batch. When the cookies are thoroughly cooled, show your child how to make the badges by squeezing a quarter size dollup of icing onto the center of each larger star and then gently pressing a smaller star down on top of it. Next, use small dabs of icing to "glue" round yellow candies atop the tips of the larger star.